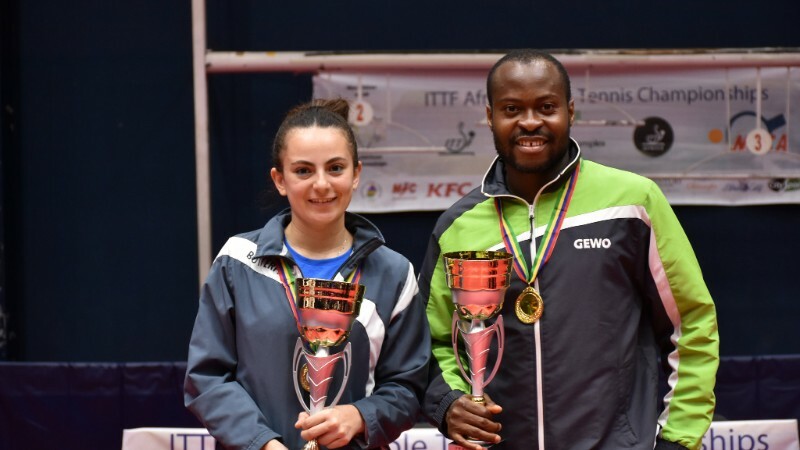 Top seeds in their respective Women’s & Men’s Singles events, Dina MESHREF (EGY) and Quadri ARUNA (NGR) has met all expectations as they emerged victorious in Port Louis, Mauritius at the 2018 ITTF-African Championships that ran from 3rd to 9th September 2018 to be crowned African Champions. ARUNA, the Nigerian superstar, has been incredibly successful in his career and is recognized as one of the top players from Africa. It thus comes as a surprise that his victory in Mauritius was the first time he has won the coveted African Championship crown. Having lost the final two years prior, ARUNA made no mistakes as he faced Ahmed SALEH for gold, crushing his opponent in 5 games (11-7, 6-11, 13-11, 11-9, 11-1). Such was the form that he was in, the Men’s Singles Champion did not lose a game prior to the final, becoming the first Nigerian to win the event since 2002. His appetite for victory was evident from the start as he led the Nigerian team to their first Men’s Team Gold since 2008, ending a 10 years draught and booking the team a place in the 2019 Team World Cup as African Champions. Two Golds for ARUNA but yet he was not the most successful individual in Port Louis. That honor goes to MESHREF. Having won the Women’s Team title and the Mixed Doubles title with SALEH, she entered the Women’s Singles Final high on confidence. Taking on colleague Reem EL-ERAKY, MESHREF displayed her prowess on the table with a convincing 4-0 (11-5, 11-8, 11-6, 13-11) victory. A second African Championship title won in three final appearances after missing out on it in 2016. Still only 24 years of age, she could yet add to her title haul. To add to the already impressive gold tally for Egypt in Mauritius, the Men’s and Women’s Doubles title was contested in an all Egyptian final. Youssef ABEL-AZIZ and Khalid ASSAR overcame the more experienced pair of Mohamed EL-BEIALI and SALEH 4-0 (11-5, 11-9, 11-9, 11-2) to win the Men’s Doubles title. Meanwhile, EL-ERAKY partnered Farah ABEL-AZIZ to take down Yousra HELMY and MESHREF 4-3 (12-10, 6-11, 11-7, 4-11, 5-11, 12-10, 11-6) in a thrilling encounter to be crowned Women’s Doubles Cham.